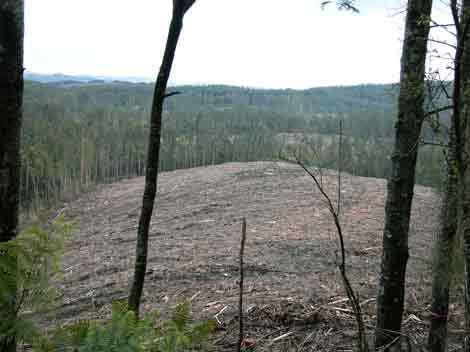 In March 2003 Hancock Watch was recommending buffers of 100 metres on cool temperate rainforest in this catchment. By January 2005 it is evident that buffers have generally been granted of 20 metres, with one buffer measured at a measely 7 metres. This is an unsustainable and unecological outcome. Aerial Photograph of Morwell River East Branch 1967. Most of the catchment is native vegetation, not cleared farmland. 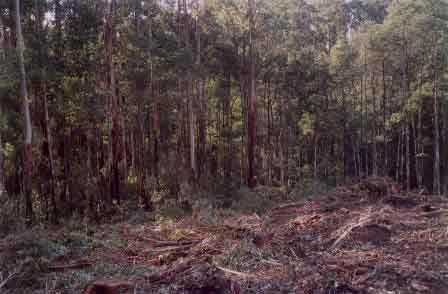 Many people are under the impression that the Strzelecki forests were completely devastated in the early 20th century and replanted with trees by the Forests Commission and Australian Paper Manufacturers (APM) from the 1940's onwards. This may have been the case in some parts of the Strzeleckis, however much of this catchment in the 1960's was regrowth native forest and remnant forests. 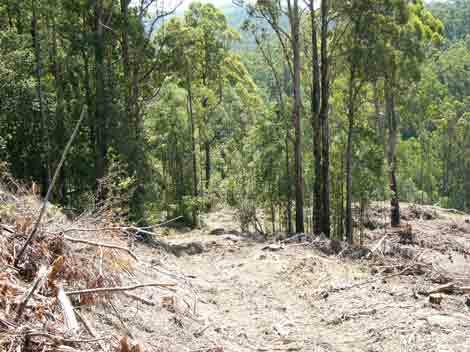 Some cleared farmland remained, however in this catchment is it very highly likely that APM cleared native forests in the late 1960's and early 1970's and established hardwood 'plantations' in the south of the catchment and pines in the north of the catchment. Much of the catchment is leased crown land by APM (now PaperlinX). The blurred red text in the photo above is Midland Hwy. The Forests (Wood Pulp Agreement) Act 1961, granted APM a lease of 8731 acres of land in the northern Strzeleckis in the Parishes of Bulga, Callignee, Jeeralang and Jumbuk. Catchments comprised mainly of Traralgon Creek, Jeeralang Creek and Middle Creek. The Act was set up because apparently the 1939 fires decimated forests under 1936 Wood Pulp Agreement Act. 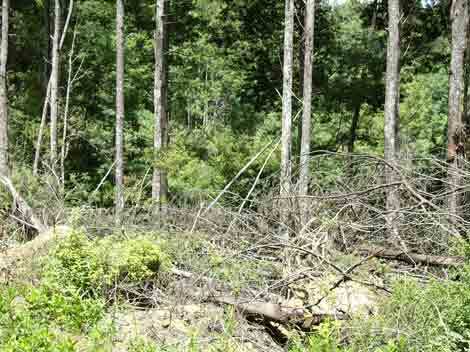 APM had to obtain an agreement with the Forest Commission to source much of its pulpwood from outside of the agreed Forest Area at considerably increased cost to the company. 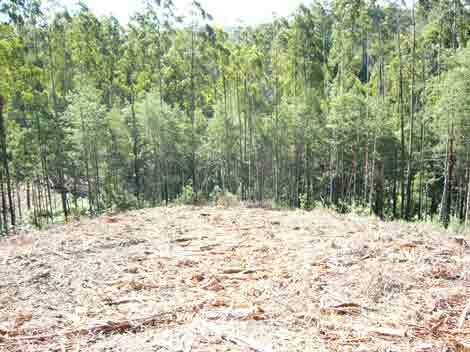 (c) for the purposes of establishing plantations and replacing some of the resources of pulpwood lost to the company since the commencement of the Wood Pulp Agreement 1936, the leasing to the company of certain areas of State forest in the eastern Strzelecki ranges (being the lands described in the form of lease set out in the schedule hereto) which are at present unproductive". The 1961 act was added to by the Wood Pulp Agreement Act 1966: According to LB Williams 'The Forests (Wood Pulp Agreement) Act 1966 "To help overcome this deficiency the 1966 Act lays down the procedure to be adopted for the leasing of Commission land to the company for the growing of trees for pulpwood. This should assist the company develop an additional reserve of high grade pulpwood - particularly Mt Ash. 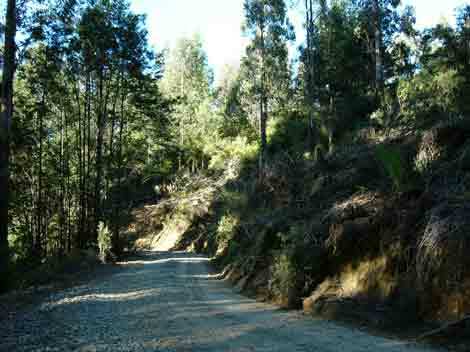 At the present time the company leases from the Commission about 8700 acreas of land in the eastern Strzelecki Ranges. Terms of this lease require the company to establish trees in the plantable area contained therein over a period of 16 years. Since 1961 more than 2000 acres have actually been established. It is anticipated that a further area of about 12000 acres will be made available in the Middle Creek and East Morwell river basins. This area abuts the current lease area and would in effect be an extension thereof". 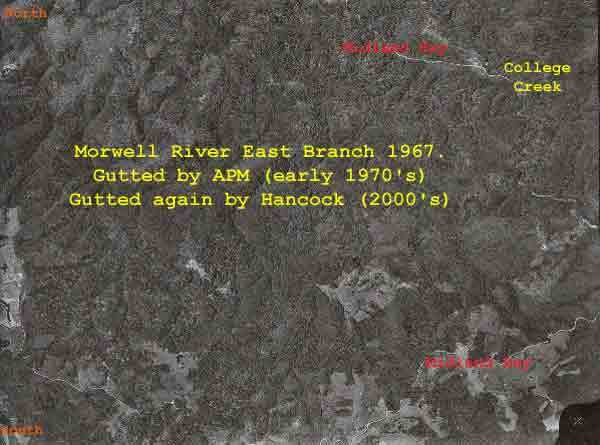 Therefore much of the Morwell River East Branch was effectively sacrificed to APM under the 1966 Wood Pulp Agreement Act. March 03: Strzelecki Ranges - Morwell River East Branch Rainforest: Over the past few years Hancock Watch has been attempting to highlight the plight of cool temperate rainforest in the Strzelecki Ranges. Most of our attention has been focussed on the rainforests that were controlled by Victorian Plantations Corporation on the southern side of the Strzeleckis. 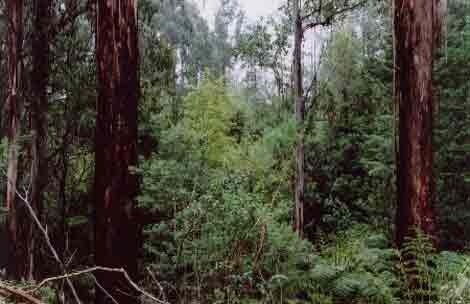 There are of course cool temperate rainforests on the northern slopes of the Strzeleckis on land that was controlled by Australian Paper Plantations (APP). 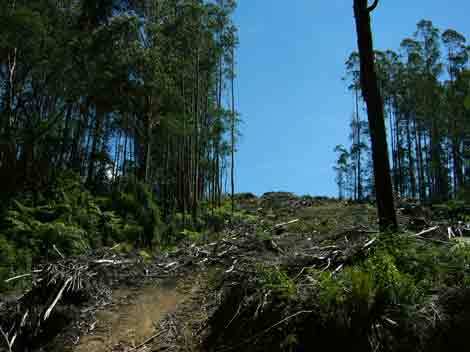 When Hancock took over the assets of APP in August 2001, they also took over the custodial role of protecting the surviving rainforest on the northern slopes. Hancock Watch has highlighted College Creek (a northern aspect rainforest) in the past. Over the next few months we will also place attention of other rainforests of the northern slopes such as Morwell River East Branch. 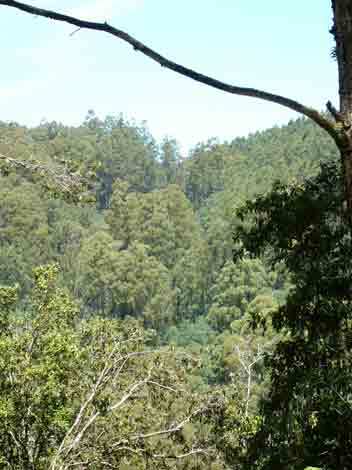 Although somewhat more 'degraded' than other rainforests in the region, Morwell River East Branch rainforest still is of significant conservation importance. The rainforest in this catchment has high integrity and is of a Nationally rare type. It is virtually weed free and covers a substantial area of the catchment. Hancock Watch is supporting initiatives to protect the Morwell River East Branch rainforests with buffers of at least 100 metres. 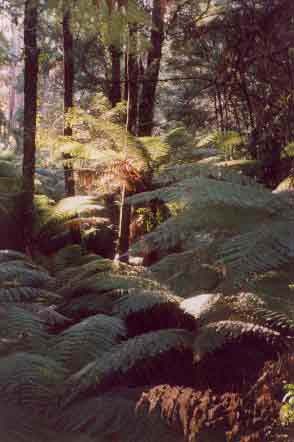 Rainforest on the northern slopes of the Strzeleckis also occurs most notably in the Middle Creek catchment with cool temperate rainforest 'isolates' also occurring in the Jeeralang Creek and Traralgon Creek catchments. 100 metres buffers are required on Morwell River East Branch rainforest in order to protect this area from the impacts of the disease Myrtle Wilt and possible impacts of wildfire. Strzelecki Ranges - Morwell River East Branch. This cool temperate rainforest area warrants 100 metres protection on all buffers surrounding rainforest within the catchment. Morwell River East Branch. This cool temperate rainforest area warrants 100 metres buffer zone protection. Note the Myrtle Beech tree - a remnant of Gondwana. Morwell River East Branch cool temperate rainforest - currently adjacent logging coupes in the catchment. 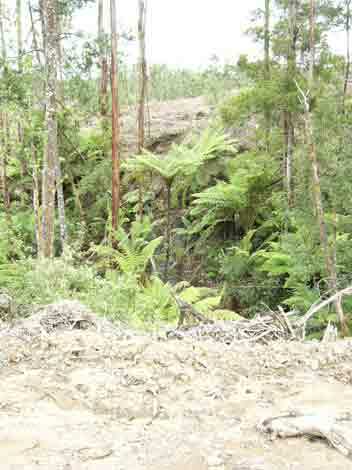 Hancock Watch demands 100 metres minimum buffer zone protection around these relics of Gondwanaland in this catchment. 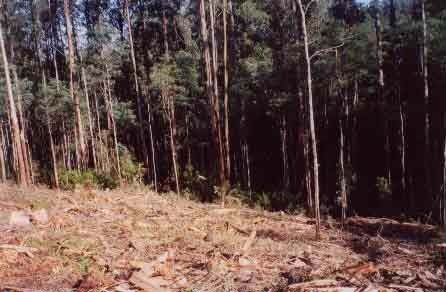 March 03: Strzelecki Ranges - Cable logged pine plantation on Morwell River East Branch (off Midland Hwy). Note lack of buffers in gully foreground. 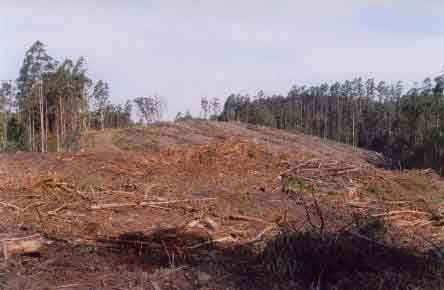 This was a site previously managed by Australian Paper Plantations (and it shows)..
March 03: Strzelecki Ranges - Recently logged pine plantation in Morwell River East Branch (off Midland Hwy). This site had a series of snig tracks cut into the hillside. All were eroding badly and will continue to do so especially if heavy rain eventuates. July 2003: Strzelecki Ranges (Parish of Budgeree). Scanlon Road in the Morwell River East Branch catchment on land leased from the Crown. 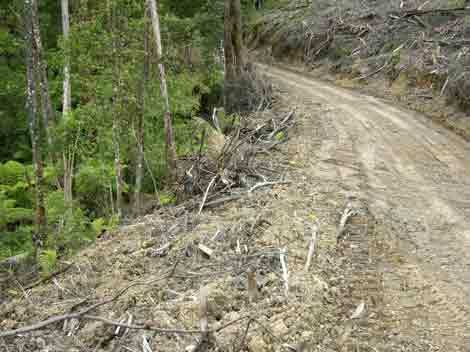 This is an example of very poor roading standards that technically could breach the Code of Forest Practices. Hancock Watch could not locate drains or culverts in many places on this road. 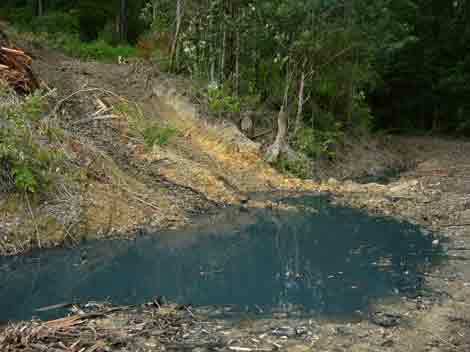 These poor practices could lead to excessive sedimentation of the Morwell River East Branch and are a poor reflection on a company attempting to gain certification through the Forest Stewardship Council. 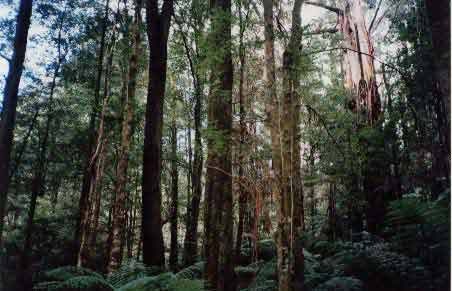 July 2003: Strzelecki Ranges (Parish of Budgeree). 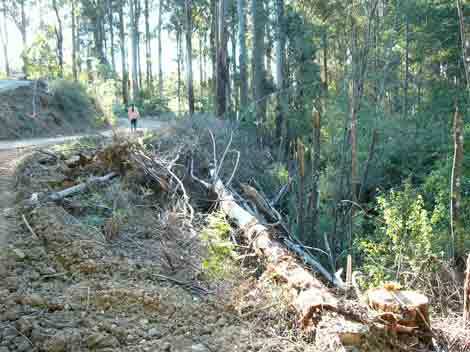 More dismal roading on Scanlon Road in the Morwell River East Branch catchment. July 2003: Strzelecki Ranges (Parish of Budgeree). Another photo of excessive sediment build up on Scanlon Road. Imagine what this road will be like once the drought breaks! July 2003: Strzelecki Ranges (Parish of Budgeree) - Morwell River East Branch. 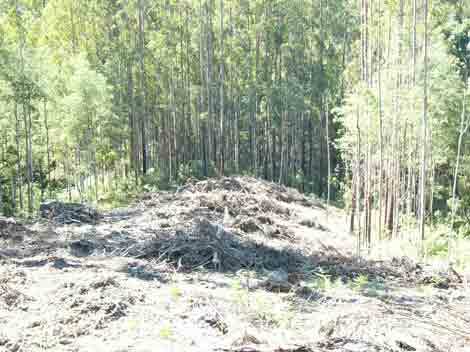 Photo of recent clearfell pine logging showing where log dumps have been set alight. Such high intensity burns scorch soil and may lead to phosphorous build up entering the waterways after rainfall. 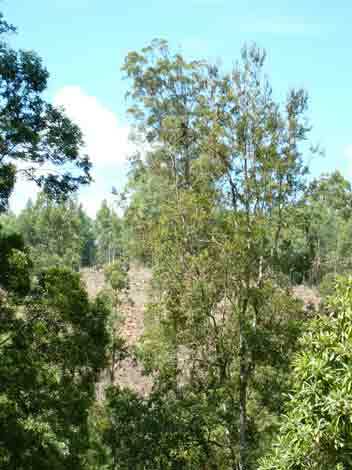 Many of Hancock's pine plantations are being converted into Shining Gum plantations, this raises major concerns as Shining Gum can cross pollinate with indigenous species of the Strzeleckis such as such as Swamp Gum (E. ovata), Mountain Grey Gum (E. cypellocarpa), Blue Gum (E. globulus) and Manna Gum (E. viminalis). For more information on cross pollinisation of plantation eucalypts see here. 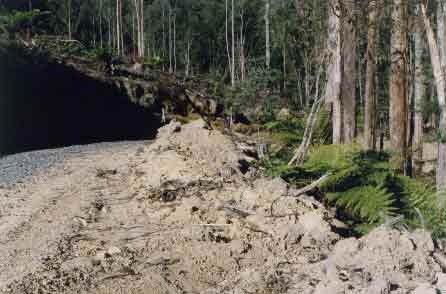 July 2003: Strzelecki Ranges (Parish of Budgeree) - Morwell River East Branch. 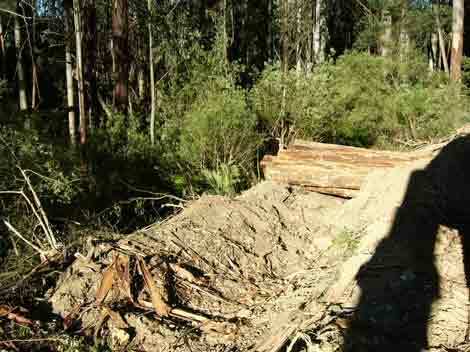 Recent clearfell plantation logging exposes large expanses of soil to wind and water erosion. Note also snig tracks that have gouged the slopes. 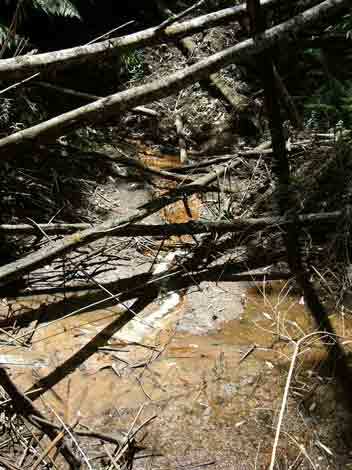 Such practices can lead to erosion problems in a catchment that has been severely degraded through poor agricultural and logging practices. 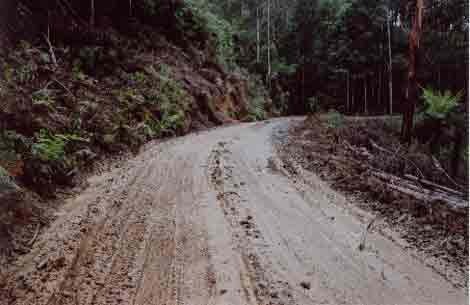 May 2004 Strzelecki Ranges north face: Poor roading on Bart Track in the Morwell River East Branch catchment - probably in the Parish of Wonyip. Heavy rain will most likely play havoc with the Lower Cretaceous Sediments on this site. Hancock is currently logging APM Mountain Ash established from 1971/2 at this location. This is leasehold land. May 2004 Strzelecki Ranges north face: Decent enough buffers near Barts Track in the Morwell River East Branch catchment. But will these buffers be sufficient to protect water quality from the poor roading at this location? 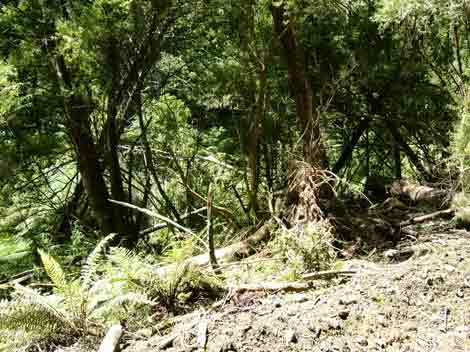 June 2004: Strzelecki Ranges north face - Morwell River East Branch (Allotment 56 Parish Wonyip leasehold land). 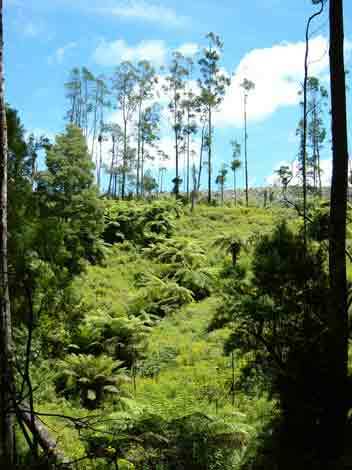 The rainforest in this catchment has high integrity and is of a Nationally rare type. It is virtually weed free and covers a substantial area of the catchment. Hancock has gone to the trouble of mapping the rainforest and commissioning an ecological consultant to address and evaluate the ranking of Cool Temperate Rainforest based on flora assessment only. Rainforest is a remnant of Gondwanaland. 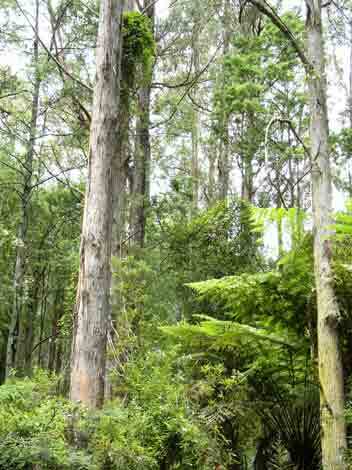 June 2004: Strzelecki Ranges north face - Morwell River East Branch (Allotment 56 Parish Wonyip leasehold land). Ground staff have gone to great lengths to delinate rainforest and native vegetation, however management decisions have not allowed the precautionary principle to prevail and in some cases have not afforded the minimum standards of buffer protection as provided on Public Land. 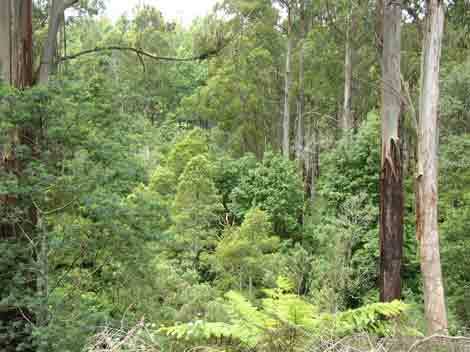 Hancock Watch argues that even the buffer protection afforded on public land is minimal and we argue that cool temperate rainforest of regional significance, such as Morwell River East Branch should be afforded buffers of at least two tree lengths, in order to protect the stands from the impacts of the disease Myrtle Wilt. Preferably 100 metre buffers should apply on rainforest within this catchment. 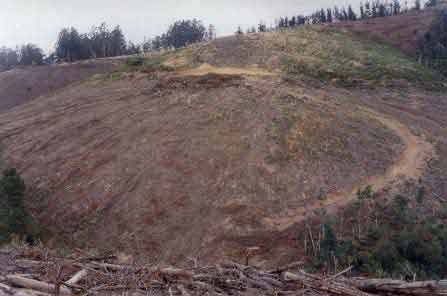 June 2004: Strzelecki Ranges north face - Morwell River East Branch (Allotment 56 Parish Wonyip leasehold land). 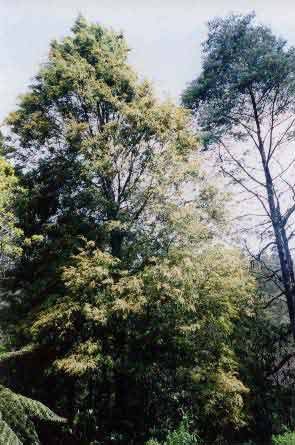 Recent publications note that a minimum of 2 tree lengths is required to protect rainforest from the fatal disease myrtle wilt. In the above photograph, clearfelled hardwood plantation can clearly be seen in very close proximity to the rainforest. At this site the buffer on the cool temperate rainforest was measured at only 25 metres! 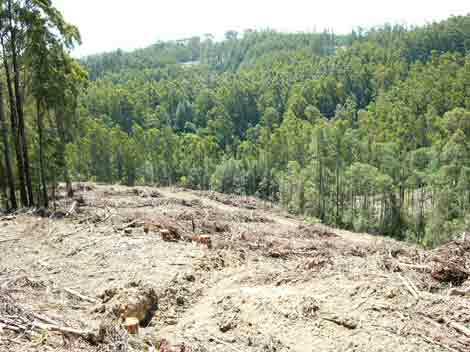 This is a disgrace for the only forest company in Australia to have been awarded Forest Stewardship Certification. 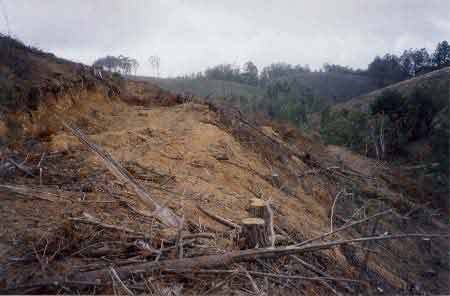 June 2004: Strzelecki Ranges north face - Morwell River East Branch (Allotment 56 Parish Wonyip leasehold land). At this location the buffer on cool temperate rainforest was measured to be 25 metres. An adequate buffer at this site would have meant that none of the trees felled in this photograph would have been logged. The trees logged at this site were 32 year old Eucalyptus Regnans. John Hancock Insurance Company has assets in the vicinity of $US150 billion. For such a massive company to 'short change' the Australian environment by not granting increased buffer widths on cool temperate rainforest in Australia is extraordinary. How many people investing in Hancock realise that their investments could mean the long term eradication of cool temperate rainforest in the Morwell River East Branch? 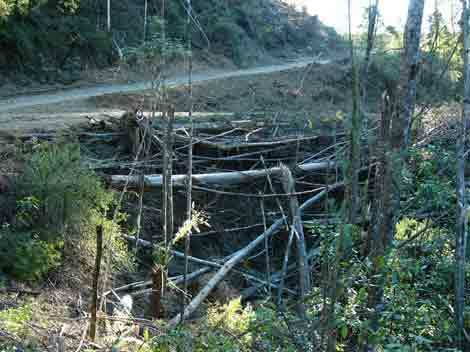 June 2004: Strzelecki Ranges north face - Morwell River East Branch (Allotment 56 Parish Wonyip leasehold land). At this location the buffer on cool temperate rainforest was measured to be between 30 - 40 metres. An adequate buffer at this site would have meant that none of the trees felled in this photograph would have been logged. 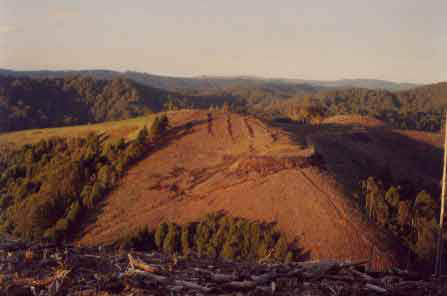 June 2004: Strzelecki Ranges north face - Morwell River East Branch (Allotment 56 Parish Wonyip leasehold land). 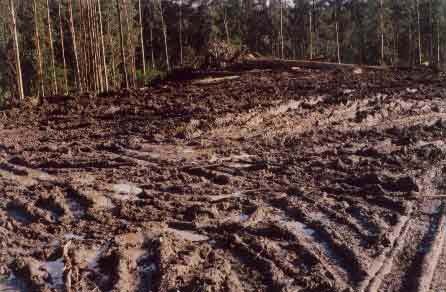 Recent logging activities have recently been taken place in wet weather, placing obvious stresses on soil. Such activity possibly breaches part 3.2.12 of the Code of Forest Practices for Timber Production. 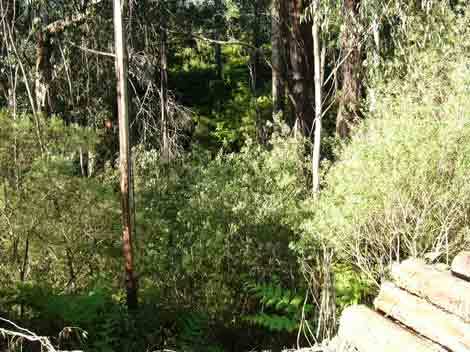 June 2004: Strzelecki Ranges north face - Morwell River East Branch (Allotments 56 & 59 Parish Wonyip leasehold land). The land in the foreground is leasehold, whilst the land in the background was purchased by Hancock from Australian Paper Plantations in August 2001. This view is looking south west. The gully to the right contains cool temperate rainforest and has been afforded buffers of only 30-40 metres. Trees logged from this site were 32 year old Mountain Ash. 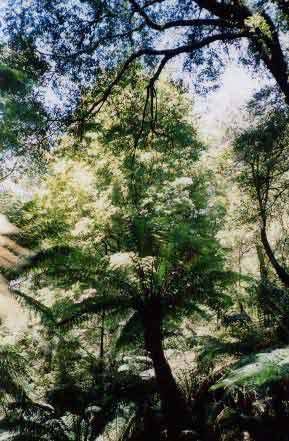 September 2004: Strzelecki Ranges North Face (Parish of Jumbuk - Crown Leasehold): Morwell River East Branch Rainforest off Lawless Track. Hancock have logged within 15 metres of cool temperate rainforest at this site. 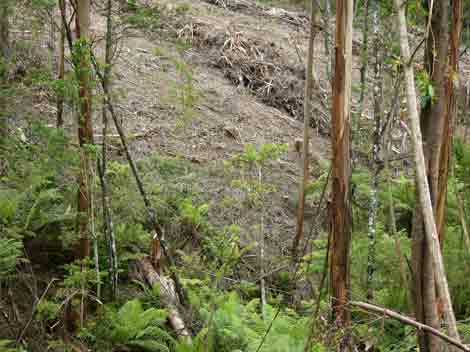 The person holding the tape in the gully is standing next to a Myrtle Beech tree. 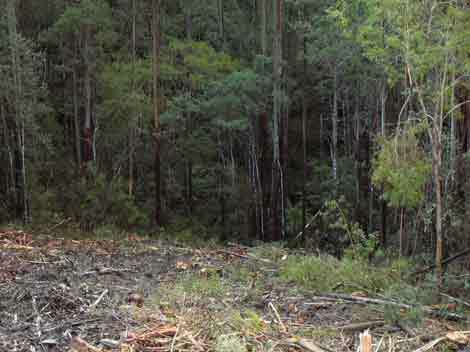 Rainforest of regional significance occurring in State Forest is granted at least 40 metre buffers. Yet Hancock at this site has granted 25 metre less than what is warranted in State Forests. This has occurred despite Hancock being granted FSC certification. 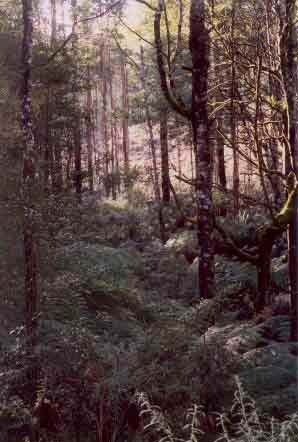 September 2004: Strzelecki Ranges North Face (Parish of Jumbuk - Crown Leasehold): Morwell River East Branch Rainforest off Lawless Track. 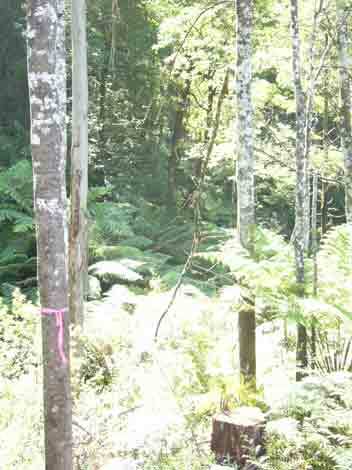 Logging has occurred within 2 metres of young Myrtle Beech trees. 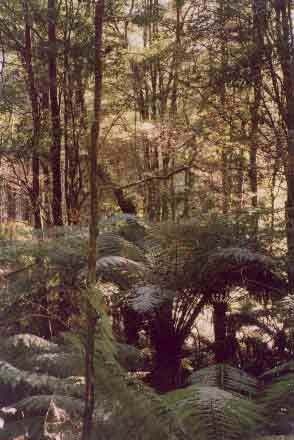 September 2004: Strzelecki Ranges North Face (Parish of Jumbuk - Crown Leasehold): Morwell River East Branch Rainforest off Lawless Track. Photo showing coupe boundary. Note that trees have fallen into rainforest area. These trees were knocked over by tree fall. 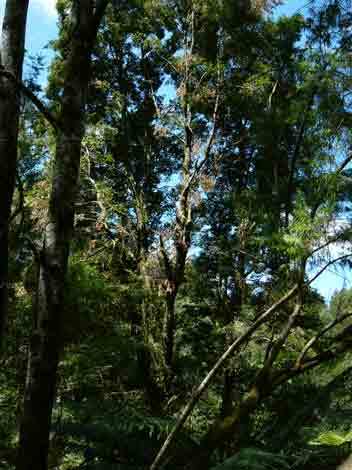 Cool Temperate Rainforest requires buffers of at least two tree lengths to protect against tree fall, which can wound Myrtle Beech trees, leading to Beech trees being infected with the disease Myrtle Wilt. September 2004: Morwell River East Branch. Probably allotment 51D Parish of Binginwarri on land leased to the Crown since 1926. This photo shows the scale of the clearfelling. September 2004: Strzelecki Ranges North Face: Morwell River East Branch - Lawless Track. Head of gully very recently logged by Hancock, most likely located in the College Creek cores and links area, just off Midland Highway. 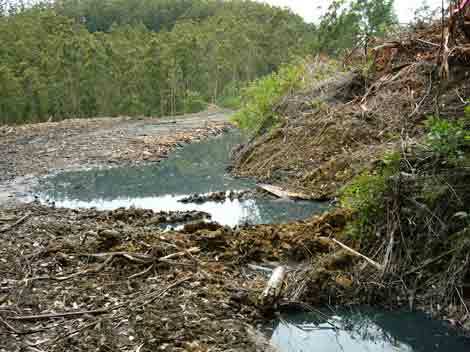 November 2004 - Morwell River East Branch Catchment: Log dump placed within 20-30 metres of cool temperate rainforest of regional significance. This shows complete disregard for the risks associated with the long term survival prospects of cool temperate rainforest in the Strzeleckis. Why would you place a log dump here? 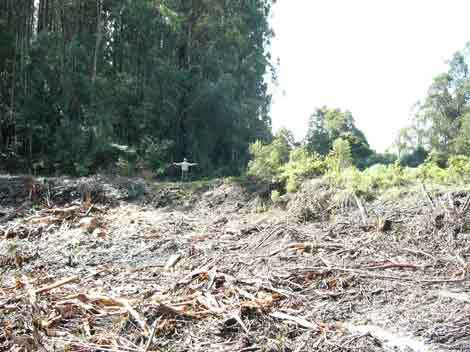 November 2004 - Morwell River East Branch Catchment: Log dump placed within 20-30 metres of cool temperate rainforest of regional significance. 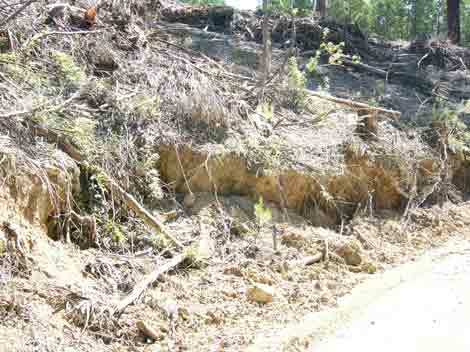 November 2004 - Morwell River East Branch Catchment: Atrocious roading and working in wet weather has meant that native trees have been cut down at the head of this gully in order to stabilise the road. 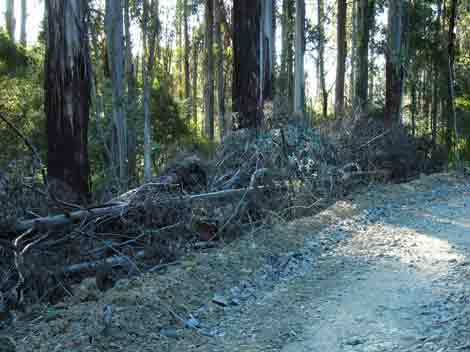 Many trees have been cut down on this roading section. 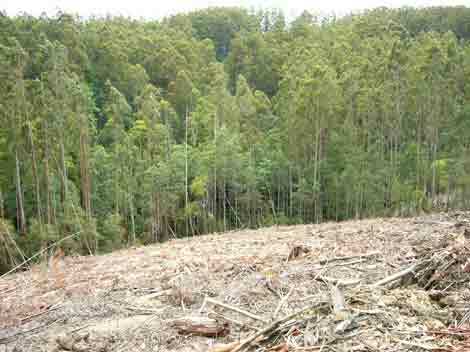 November 2004 - Morwell River East Branch Catchment: Cut down trees in very close vicinity to cool temperate rainforest. 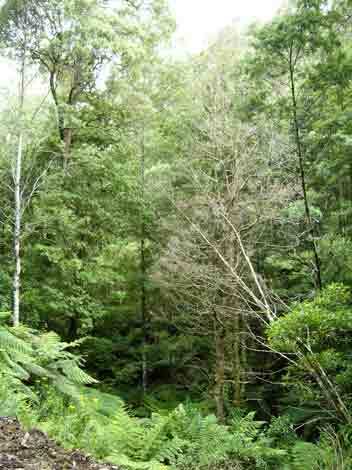 November 2004 - Morwell River East Branch Catchment: Logged cool temperate rainforest buffer. Hancock showing disregard for protection of cool temperate rainforest of regional significance. November 2004 - Morwell River East Branch Catchment: Cut down trees into drainage line. This practice is a breach of the Code of Forest Practice. 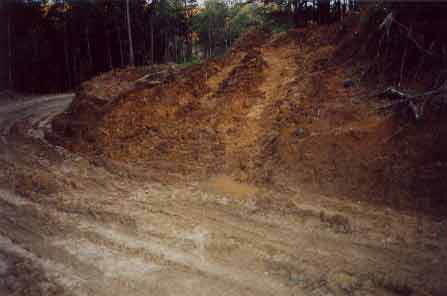 November 2004 - Morwell River East Branch Catchment: Same section of roading in October 2004. 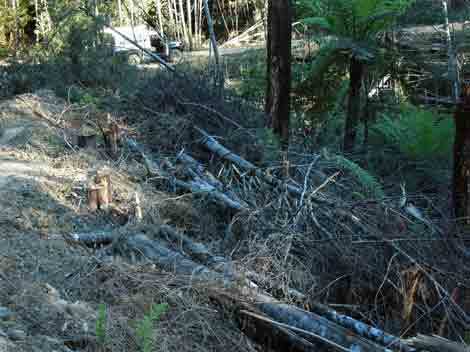 Note that wet weather logging has been occurring and note that some trees had already been logged at this site. 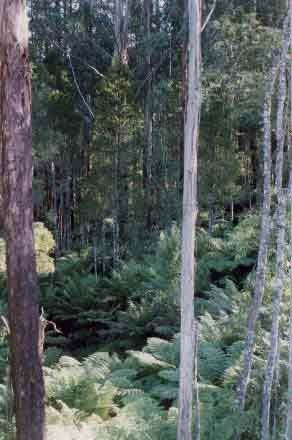 October 2004 - Morwell River East Branch Catchment: Cool Temperate Rainforest with extremely limited buffers near logging road. January 2005 Parish of Jumbuk - ex APM Leasehold land. Morwell River East Branch Cool Temperate rainforest with scant buffers protecting the rainforest against the impacts of fire, windfall and the disease Myrtle Wilt. 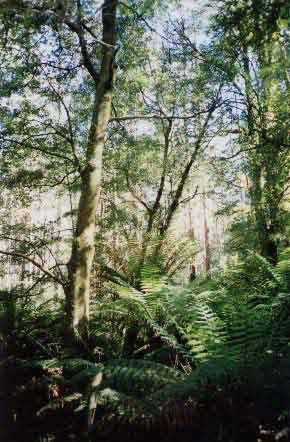 The rainforest of the Morwell River East Branch is of regional significance. January 2005 Parish of Jumbuk - ex APM Leasehold land. At this location on a tributary of the Morwell River East Branch a buffer of only 7 metres was recorded when the area was logged in late 2004. This is appalling and flys in the face of ecological common sense. 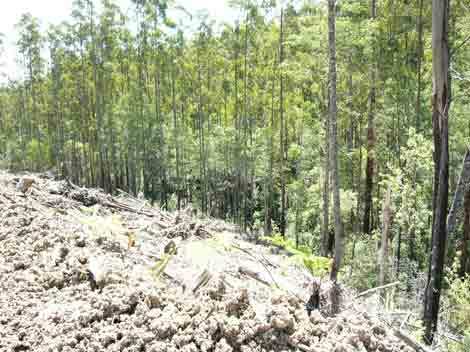 It would be better to leave buffers of at least two tree lengths, but Hancock in their haste to log the catchment, have granted the rainforest almost absolute minimal 'protection'. This is very poor form considering that Hancock will be audited by Smartwood in February/March 2005. Why would Hancock rush in to log this area without their rainforest BMP being completed and peer reviewed, knowing that an audit will follow in only a few months time? "CAR 1 -2004: The Rainforest Management BMP shall be completed by 1 March 2005 including an independent peer review and further stakeholder input. 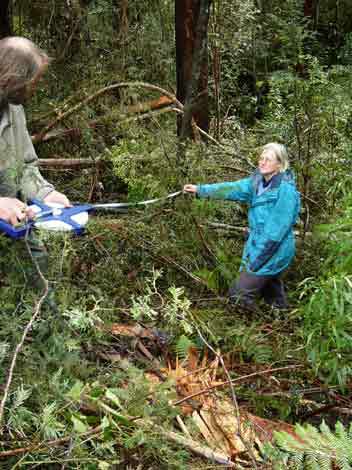 The current accepted practice of stakeholder involvement in boundary marking is to continue with coupes where HVP/GRP harvests plantations adjacent to any areas of Cool or Warm Temperate Rainforest. Observation 1 -2004: Given stakeholder concerns and limitations, GRP should explore short-term alternative mechanisms for ensuring that it can obtain stakeholder input into the design of rainforest buffers and related management activities until such time that the Rainforest Management BMP is completed and practices dictated by the new BMP are fully internalized by HVP/GRP staff." Why haven't Hancock done this? January 2005 Parish of Jumbuk - ex APM Leasehold land. Morwell River East Branch Cool Temperate rainforest. At this location buffers of only 30 metres have been granted by Hancock. 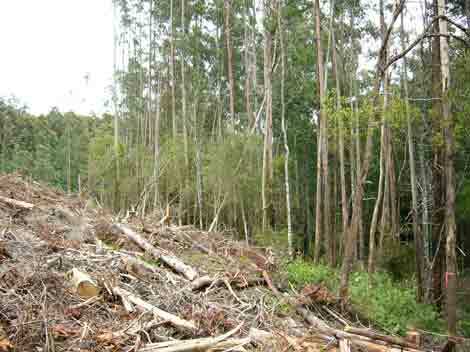 Hancock intend to log over 800 hectares of 'hardwood plantations' in the Gippsland region in 2004/5. January 2005 Parish of Jumbuk - ex APM Leasehold land. Morwell River East Branch Cool Temperate rainforest 'buffer'. January 2005 Parish of Jumbuk - ex APM Leasehold land. Morwell River East Branch Cool Temperate rainforest buffer, showing trees already falling into the buffer after being knocked over during logging activities. Wind can also play havoc with buffers and don't even mention fires. January 2005 Parish of Jumbuk - ex APM Leasehold land. Morwell River East Branch Cool Temperate rainforest showing an example of Myrtle Wilt. For more information see here. January 2005 Parish of Jumbuk - ex APM Leasehold land. Morwell River East Branch Cool Temperate rainforest. At this location logging and roading debris had been pushed into a 'buffer' only a few metres from young and emerging Myrtle Beech. Same as above, but at a different location in the catchment. January 2005 Parish of Jumbuk - ex APM Leasehold land. Morwell River East Branch. Poor roading and drainage is a common problem. January 2005 Parish of Jumbuk - ex APM Leasehold land. Morwell River East Branch. Regrowth Messmate - non plantation. Hopefully this forest will not be logged. January 2005 Parish of Jumbuk - ex APM Leasehold land. Morwell River East Branch. Inappropriate buffers occurred on this 'drainage line' which was flowing in the middle of summer, meaning it could be defined as a Permanent Stream. This should have meant that a 20-30 metre buffer be left on this tributary. Not 5 to 10 metres as Hancock has granted. 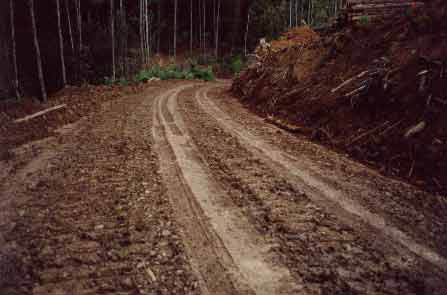 Jan 05: Examples of poor roading and wet weather work in the Morwell River East Branch. January 2005 Parish of Jumbuk - ex APM Leasehold land. Morwell River East Branch. Slender Tree Fern which is listed by the FFG Act. Inappropriate buffers occurred on this 'drainage line' which was flowing in the middle of summer, meaning it could be defined as a Permanent Stream. This should have meant that a 20-30 metre buffer be left on this tributary. 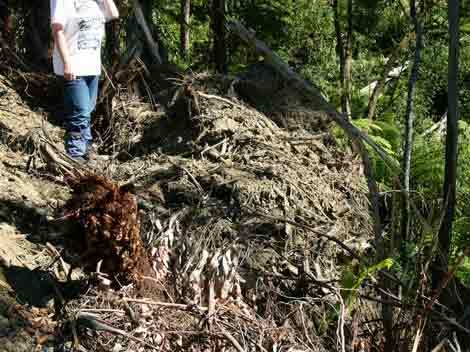 Debris knocked over by logging came very close to damaging this fern. January 2005 Parish of Jumbuk - ex APM Leasehold land. Morwell River East Branch. 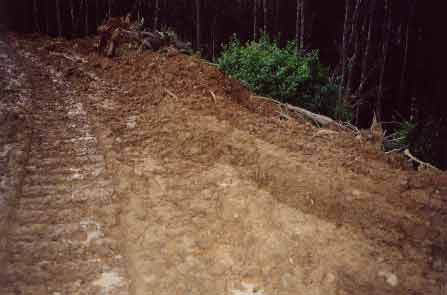 Logging access track punched through area which should have been granted a Permanent Stream buffer. This area is also highly prone to erosion. January 2005 Parish of Jumbuk - ex APM Leasehold land. Morwell River East Branch. 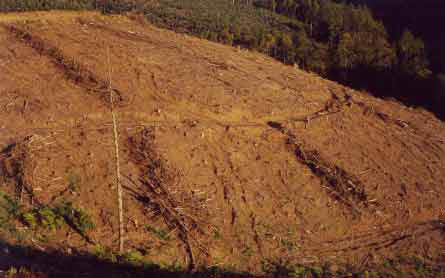 Logging access track punched through area which should have been granted a Permanent Stream buffer. This area is also highly prone to erosion. 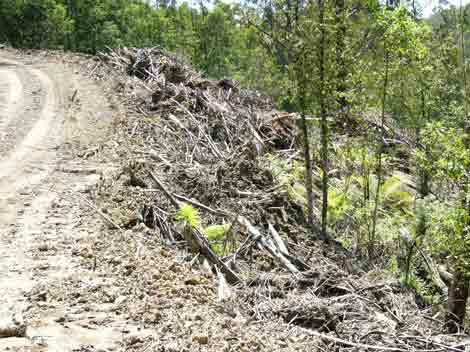 Native vegetation bulldozed to probably minimise erosion on pretty poor roads. January 2005 Parish of Jumbuk - ex APM Leasehold land. Buffer zone at this location is too small. January 2005 Parish of Jumbuk - ex APM Leasehold land. View looking across Tributary containing cool temperate rainforest. 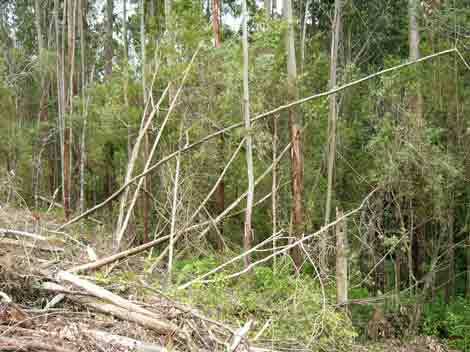 Recent logging had only granted 20 - 30 metre buffers on rainforest. January 2005 Parish of Jumbuk - ex APM Leasehold land. Very poor looking water flowing inside a buffer zone draining from recently logged area. January 2005 Parish of Jumbuk - ex APM Leasehold land. Myrtle Wilt occurring on Myrtle Beech trees on tributary of Morwell River East Branch. January 2005 Parish of Jumbuk - ex APM Leasehold land. Recent clearfelling near this natural drainage line. January 2005 Parish of Jumbuk - ex APM Leasehold land. Regrowth forests just upstream from Ebie Falls. January 2005 Parish of Jumbuk - ex APM Leasehold land. View looking down recent logging coupe into tributary containing cool temperate rainforest. Minimal buffers at this location. January 2005 Parish of Jumbuk - ex APM Leasehold land. Logging of an exclusion zone? January 2005 Parish of Jumbuk - ex APM Leasehold land. Poorly formed and unstable roading. January 2005 Parish of Jumbuk - ex APM Leasehold land. 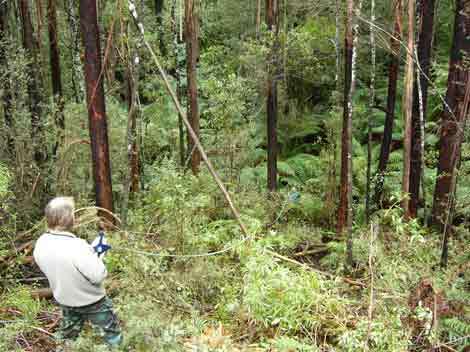 30 metre buffers measured at this location on cool temperate rainforest. January 2005 Parish of Jumbuk - ex APM Leasehold land. Roading materials pushed into gully containing cool temperate rainforest. January 2005 Parish of Jumbuk - ex APM Leasehold land. Only 20 metre buffers measured at this location on cool temperate rainforest. These buffers are a disgrace. January 2005 Parish of Jumbuk - ex APM Leasehold land. 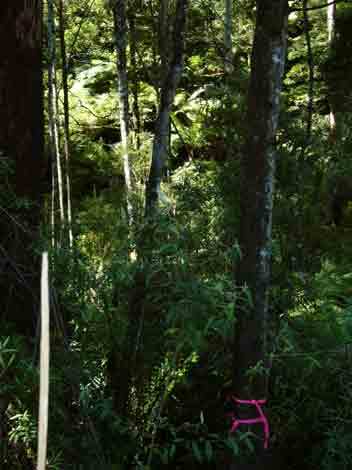 Despite only granting buffers of 20 metres on cool temperate rainforest at this site, Hancock still managed to log this tree inside their own buffer which had been previously marked with tape.